The southern resident killer whales have struggled to reproduce over the past several years, and lost three members just this year. Another orca is ailing in the critically endangered family of southern resident killer whales. K25, a 27-year-old male, documented in aerial photographs since 2008, is thinner right now than in previous years, scientists who regularly track the whales with drone photography have reported. The trouble for K25 likely started with the loss of his mother, K13, in 2017, said John Durban, biologist with the National Oceanic and Atmospheric Administration’s Southwest Fisheries Science Center in a news release. K25’s mother, like all matriarchs in the southern resident pods, helped K25 in capturing and sharing prey. Males rely on help from their mothers, and other family members, to meet their larger energy demands, Durban said. Long-term demographic monitoring has shown that adult males have an increased mortality risk following their mother’s death, highlighting K25’s vulnerability. The southern resident pod of killer whales has already suffered three losses this year, and is down to only 74 animals. On a more hopeful note for the southern residents, aerial images collected this week also show K27, K25’s sister, to be heavily pregnant, along with a number of other females in J, K and L pods, which make up the southern residents. 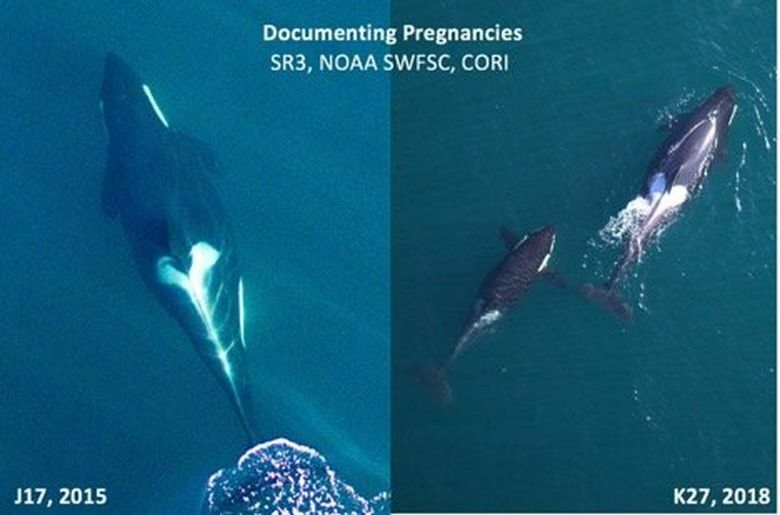 Whales carry their baby weight below the rib cage, just like humans, Durban said, enabling later-term pregnancies to be reliably documented from aerial images of body shape. But no one should get their hopes up just yet. The southern residents are enduring a high rate of reproductive failure, and K27 has been documented to have aborted a fetus in recent years. Unsuccessful orca pregnancies and dead infant orcas are sadnesses all too familiar to people who watched Tahlequah, or J35, carry her dead calf for more than 1,000 miles and 17 days last July. NOAA is asking whale watchers to keep an extra distance from the southern residents now with so many vulnerable whales. Orcas find their food by echolocation, and vessel disturbance hurts their ability to find food. The Pacific Whale Watch Association, the trade association of whale watch companies, as well as Soundwatch, a boater education nonprofit, have joined the call for boaters to keep further back. Orca whales need about 385 pounds of fish — preferably chinook — every single day to thrive, and pregnant mothers need even more. Of the multiple problems driving the southern residents to extinction, lack of food is the biggest threat to their survival. They need all the help they can get right now to get enough food. Normal distance required by law is at least 200 yards, and 400 yards if your boat is in the path of traveling whales. Boaters are requested stay back further now, and to go slower to reduce underwater engine noise. If other vessels are already in the presence of the southern residents, wait your turn and stay away, to limit the number of vessels already around the whales. “This is one action we all can take to be sure that these whales can forage peacefully at a critical time for them,” said Jeff Friedman, president of Pacific Whale Watch Association. 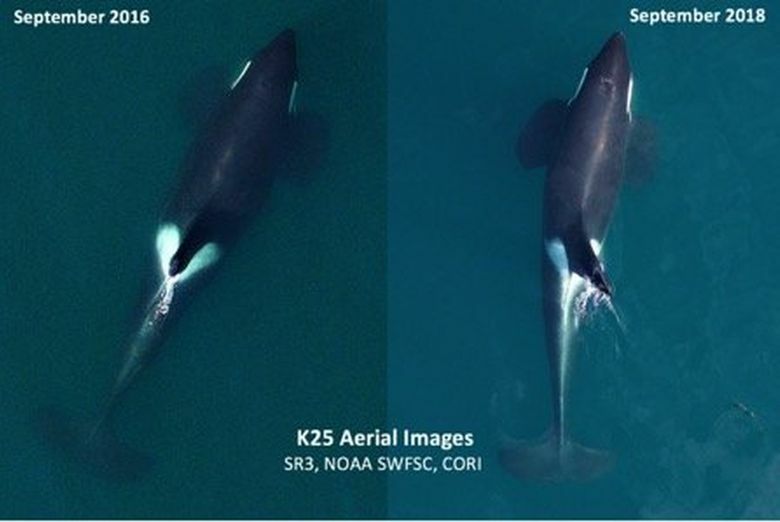 Lynne Barre, head of killer whale recovery for NOAA, said in a press release the photos of K25 are an early warning of the whale’s distress. No intervention is contemplated for the whale at this time, but the agency has a watch on his condition. K25 is not as bad off as J50, the severely malnourished 3-year-old orca that just died. Veterinarians never were able to determine exactly what was ailing her. K25’s thinner body condition “is a warning signal,” she said. Meanwhile, fish remained scarce for people, too. Federal officials determined that commercial fisheries for salmon failed this year in Washington, Oregon and California, making those fisheries eligible for federal disaster assistance. The governors from those three states and multiple Native American tribes had requested the determinations between July 2016 and March 2018. Their requests noted unusually warm and poor ocean conditions that affected fish. The disaster determinations make salmon and sardine fisheries eligible for some portion of $20 million in NOAA Fisheries fishery disaster assistance. The Commerce Department is figuring out how to allocate that money to eligible fisheries.